5 April 2007 (Pattaya Daily News) – A short piece on 10th century Prasat Hin Khao Phanom Rung in Buri Ram province. An interesting feature about the temple to Shiva is the possibility that the doorways are aligned to capture a single shaft of light once a year. The Sanskrit and Khmer inscriptions found associated with the temple have also been touched upon in a paper by HRH Princess Maha Chakri Sirindhorn of Thailand in Uncovering Southeast Asia’s Past (see related books below). Where do you come from?..”Buri Rum”..Where is that? A religious sanctuary dedicated to the Hindu god, Shiva, Prasat Hin Khao Phanom Rung symbolises Mount Kailasa, the heavenly abode of Shiva. Phanom Rung Hill rises 350 metres above the surrounding plain. 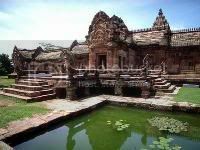 Astro-archaeological Phenomenon at Prasat Hin Khao Phanom Rung Astrologers have also predicted that an extraordinary astro-archaeological phenomenon will occur at sunrise during the April 3-5 period this year. The doors of the temple sanctuary are so perfectly aligned that during this period, at sunrise on a cloudless day with clear blue skies, the sun’s rays will shine through all fifteen doorways of the sanctuary in a single shaft of light.